The United States Mint has issued official uncirculated mint sets since 1947. Each set contains an uncirculated specimen of that year's circulating coins for every denomination issued from each mint facility. These coins received no special treatment or handling by mint personnel. However, there were exceptions made for special mint sets between 1965 and 1967 due to the coin shortage. Beginning in 2005 and continuing through 2010, coins for the uncirculated coin sets received a "satin finish." The United States Mint has sold coins to collectors ever since it was first founded in the late 1700's. In 1947 Official Uncirculated Mint sets were specially packaged by the government for sale to coin collectors. They contained uncirculated coins for each of the denominations that were produced for general circulation. There was no special handling or any consideration for the quality of the coins that were placed in the uncirculated mint sets. From 2005 until 2010, mint sets were made with coins that had a special satin finish rather than the traditional business strike finish. Coins that were struck only as Proof specimens and commemorative coins, were not included in the uncirculated mint sets. No official uncirculated mint sets were produced in 1950, 1982 and 1983. Any mint sets from these years were assembled by private individuals and not by the United States Mint. You can still buy the most recent uncirculated mint sets directly from the United States Mint. Additionally, many recently issued mint sets are available online or from your favorite coin dealer at near the original issue price. If you want top dollar for your mint sets, you need to sort them and organize them so the dealer can quickly see what you have. The following mint sets in any condition, are worth considerable more than common mint sets. As such, these coins and their original U.S. Mint packaging should be kept together when you sell your coins. The following table lists the buy price (what you can expect to pay to a dealer to purchase the coin) and sells value (what you can expect a dealer to pay you if you sell the coin). The first column lists the date and type followed by the buy price and the sell value for an average U.S. Mint Set. These are approximate retail prices and wholesale values. The actual offer you receive from a particular coin dealer will vary depending on the actual grade of the coin and a number of other factors that determine its worth. * = See the section above "Key Dates, Rarities, and Varieties" for more information on these coins. 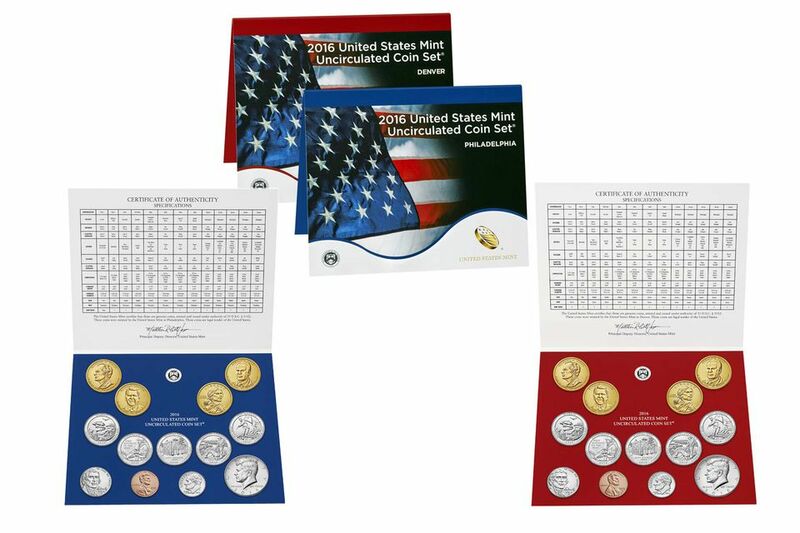 - = These sets are still being sold by the U.S. Mint and/or data is not available.